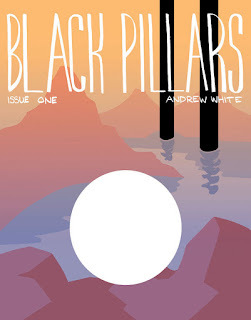 This time around I'm taking a look at some of Andrew White's earlier work: Black Pillars 1-2, from 2013-14. 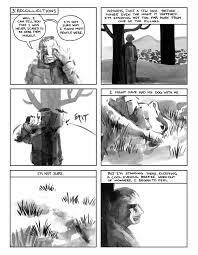 These comics, as oblique as they are, are still far more conventional than much of White's work, as they play with some standard grids, have a fairly straightforward narrative, and use conventional linework. That said, White still plays around with fracturing that narrative, doing some interesting things with the grid and generally using a handy enigmatic storytelling device to full effect. The plot of the story revolves around thousands of mysterious black pillars appearing all over the earth, defying all explanation. Touching them was not lethal, but it create a sort of dissociation of both mind and body. Eventually, the pillars disappear for no reason whatsoever. The comic follows a few people from one small town, some of whom are displaced by the pillars, and their attempts to understand what was happening. 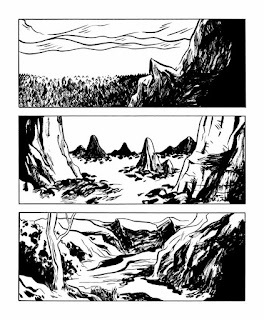 The opening five pages and the final five pages both feature stark shots of nature: mountains, forests, ruins reclaimed by nature, etc. The implication from these scenes is that the natural world in some ways will always be a mystery, one that humanity tries to tame or ascribe their own meanings to. Whether or not the pillars ever existed is almost meaningless in that context. But exist they did in the story, They are there for both the reader and the characters to ascribe meaning to: the Signifying McGuffin. In the context of this particular story, they serve as a metaphor for identity in the first issue and a metaphor for memory in the second issue. In particular, they act as a kind of tentpole for a sort of young adult vision quest, the kind where a young person is trying to envision what the rest of their life might look like. Where there are two friends, and one winds up staying in town and the other winds up leaving, and they try to squeeze as much life as possible in the remaining moments they have together. "Let's do something stupid" is their mantra in the comic. Conversations go from being solid if uninformative to simply being blank word balloons. Forms of friends go from being solid to fading out. Some of the young people make understanding the pillars and their activities their life's work, while others simply use them as an excuse to take other actions. 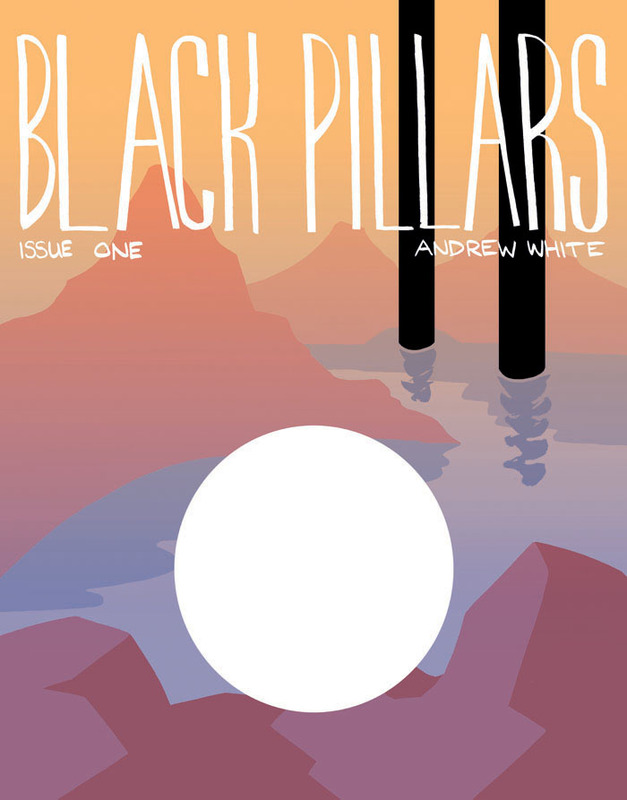 In the second issue, when the pillars have disappeared, the theme shifts from identity to memory, especially with regard to how the latter affects the former. It's years later and the friends reunite for the first time in a while to discuss what it all meant. The beginning of the story features narrative captions describing how it felt for certain elements of humanity to feel like they were reclaiming their dominion over the earth. Similarly, the friends were trying to reclaim a set of experiences by going back over their tracks and remembering them. The reality in both cases is that enumerating certain qualities of a phenomenon is not the same thing as understanding the phenomenon. Just as the first issue finds characters becoming blurry and indistinct, so too does it happen in the second issue as well. It happens because people found themselves missing the enigmatic quality of the pillars, not to mention the way in which it forced humanity to act as a kind of unit in response to their presence as sort of the ultimate team-building exercise that creates bonds through a shared experience. Ultimately, the mountains still stand and the forests still grow, and humanity is no closer to understanding or even beginning to understand how to understand the mysteries of not just nature, but the core of their own selves. Memory provides an illusion of identity and continuity, just as the forced shared experience created a sense of community. White doesn't seem to be commenting one way or another on these matters: they just are, and a phenomenon like the pillars is a simple stand-in for any number of other signifiers we encounter in our lives.